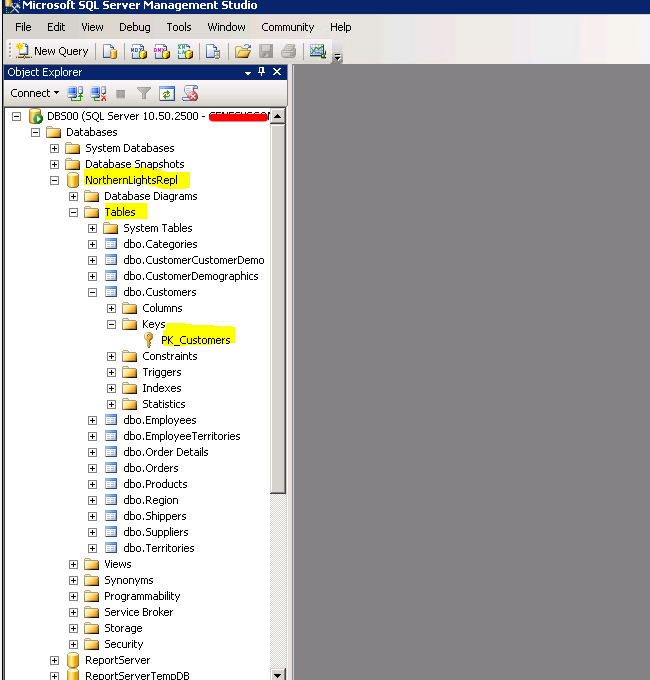 Configuring Transactional Replication between MSSQL 2000 and MSSQL 2012 Databases Part 1 | Chinny Chukwudozie, Cloud Solutions. ← Configuring Windows Server 2012 R2 NIC Teaming with EtherChannel on Cisco 3750G Switch. Microsoft® describes replication as a set of solutions that allow you to copy, distribute, and potentially modify data across your enterprise. Simply put it’s involves a mechanism that makes it possible to synchronize data across multiple database copies in any enterprise. We’ve been running MSSQL 2000 replication for a while now to isolate our Reporting user functions from the Read/Write transactions folks.Recently, we began migrating from MSSQL 2000 to MSSQL 2012. The migration process of the Databases and applications required that we setup replication between MSSQL 2000 and MSSQL 2012 temporarily. a) A Subscriber to a transactional publication can be any version within two versions of the Publisher version. 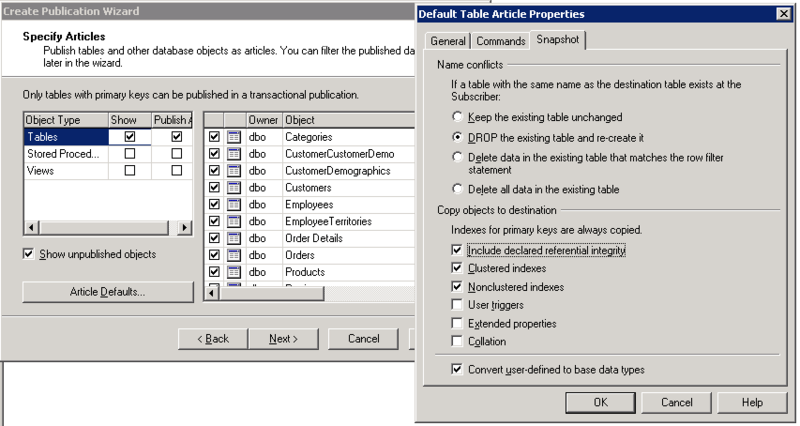 For example: a SQL Server 2000 Publisher can have SQL Server 2008 Subscribers; and a SQL Server 2008 Publisher can have SQL Server 2000 Subscribers. b) A Subscriber to a merge publication can be any version less than or equal to the Publisher version. After some testing though, I was able to get Transactional Replication working between MSSQL 2000 and MSSQL 2012, with an MSSQL 2008 server in between. a) Publisher: A source server that makes data available for replication. b) Subscriber: A target server that receives the replicated data from a publisher. c) Distributor: A database that manages the entire replication process. It could be hosted on the Publisher server, subscriber server or it’s own stand alone server. d) Publication: Simply describes the objects to be replicated. 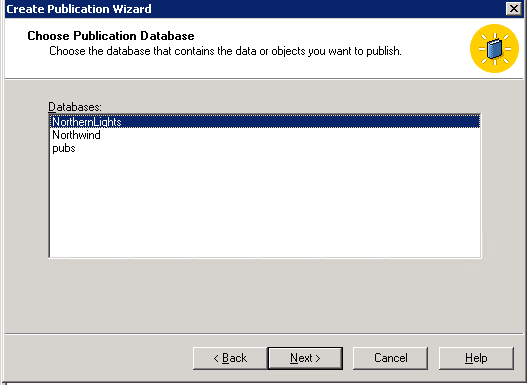 As a first step to setting up replication between MSSQL 2000 and MSSQL 2012, the source server is configured as Publisher and Distributor, the Publication is created during the same process. 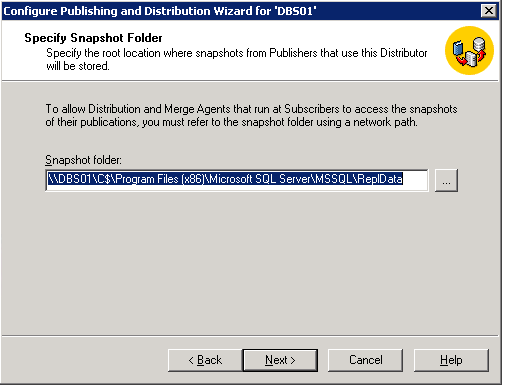 In the next step, a separate MSSQL 2008 R2 Server is setup as the subscriber to the MSSQL 2000 Server and Publisher to the MSSQL 2012 Server . 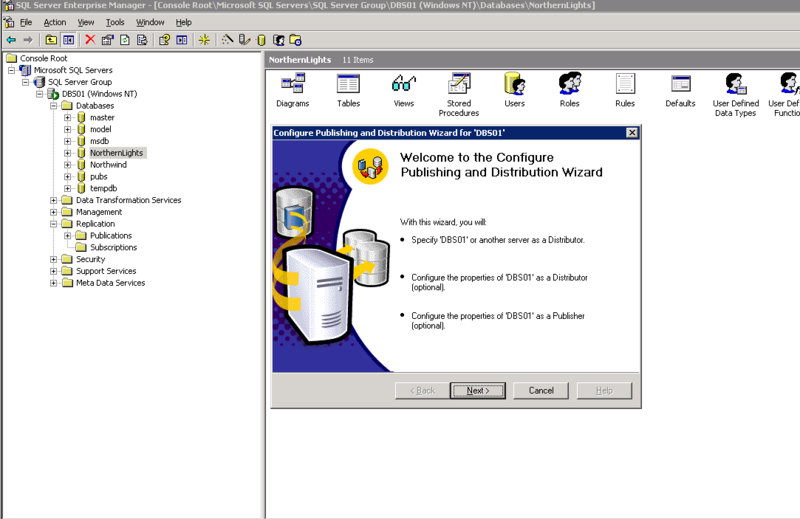 Configure Source Server as Publisher and Distributor Server. The Initial Publisher server is running on a Windows Server 2003 Server 64bit platform with MSSQL 2000 SP4. I have chosen to configure transactional replication on the NorthernLights test database. Open MSSQL 2000 Enterprise Manager and expand the server and databases folder. At the ‘Customize the configuration’ page, select to keep the default configurations except you intend to make further changes. 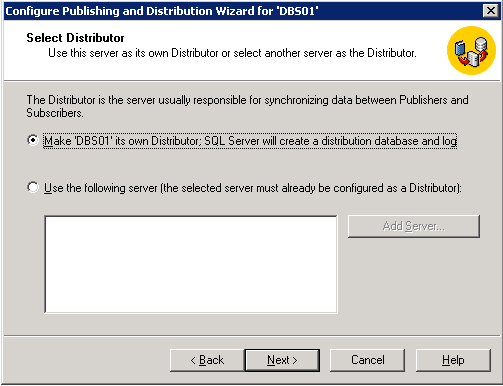 Click Finish on the next page to complete the distribution database creation and configuring the server as a publisher. 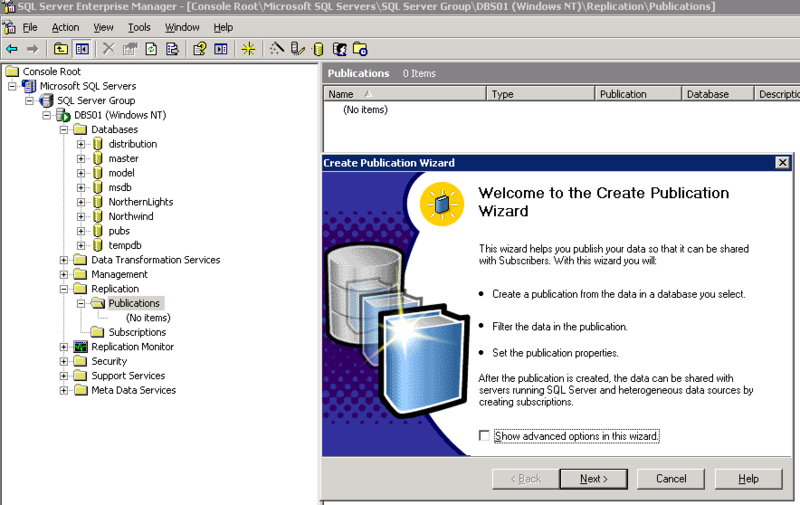 Configure Publication on the MSSQL 2000 Publisher Server. In the ‘Specify Subscriber Types’ windows, select MSSQL Server 2000. Click next on the Article Issues page. And enter a name for the Publication in the ‘Select Publication Name’ page. 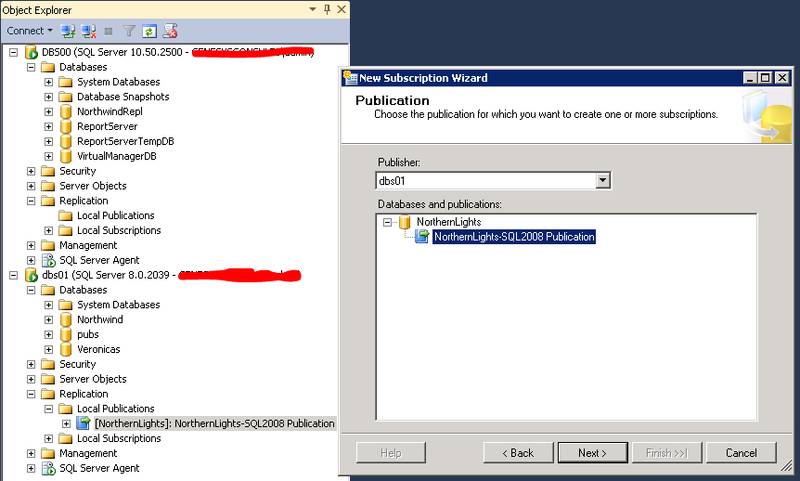 I entered the following ‘NorthernLights-SQL2008 Publication’ name. Click next. 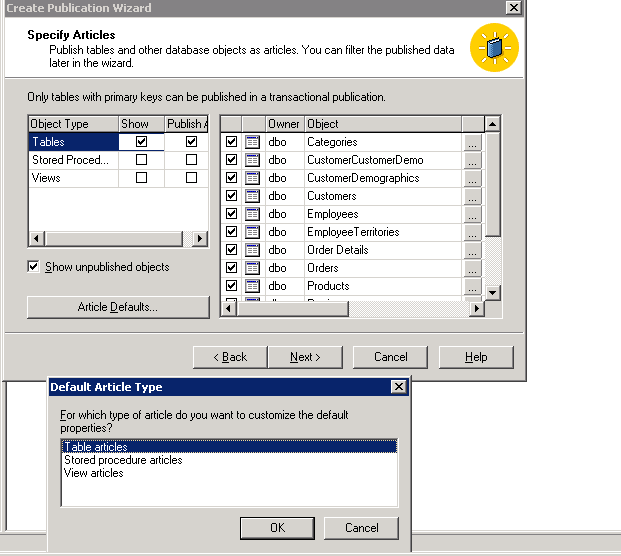 In the ‘Customize the Properties of the Publication’ page, I selected the ‘No create the Publication as specified’ radio button. Click next and click finish to complete the Publication configuration. 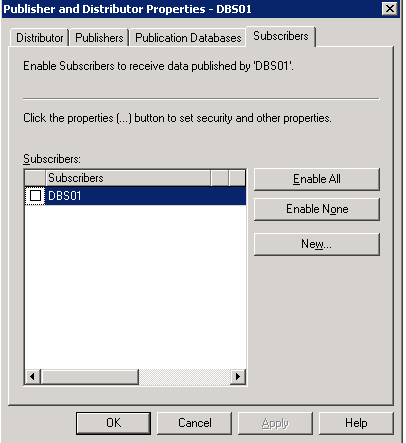 Configure Subscription on the MSSQL 2000 Publisher Server. 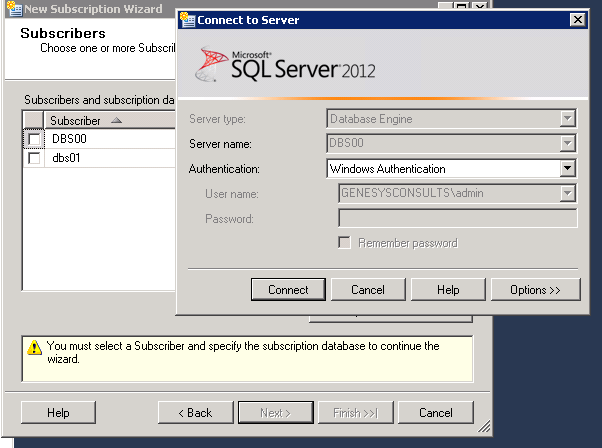 We’ll start by adding a new MSSQL 2008 Subscriber Server to the Publisher . 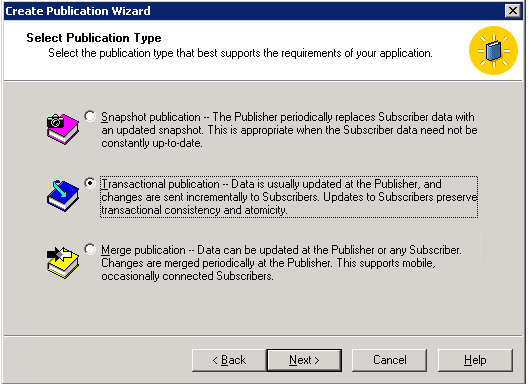 Right-click on the Replication folder and select the ‘Configure Publishing, Subscribers and Distribution ‘ command. 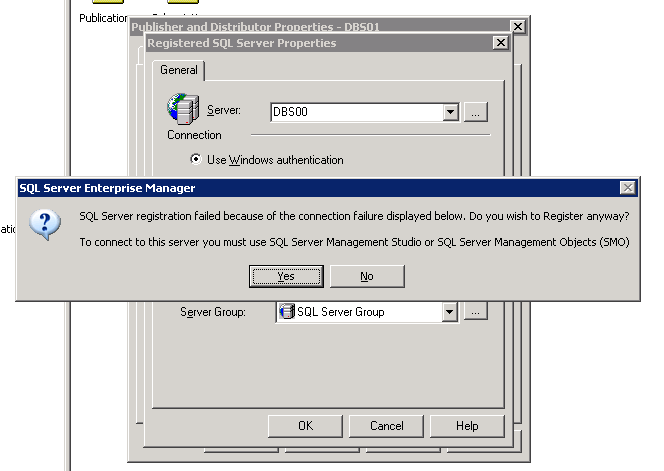 Since we are trying to create a subscription to a MSSQL 2008 Subscriber server, the reqiurement at this point is to manage the subscription configuration from a SQL Server 2008 Management Studio.Click Yes to register and add the MSSQL 2008 Server ‘DBS00’ in Enterprise Manager. 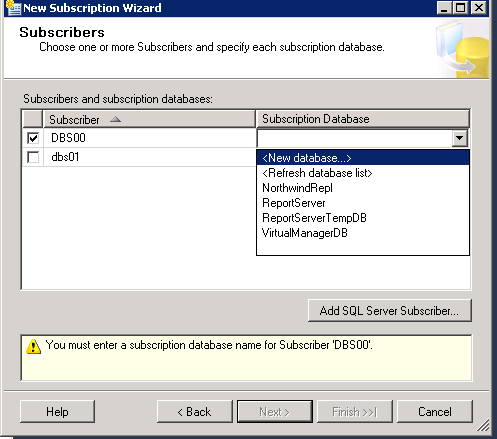 Log into the MSSQL 2008 subscriber and configure subscription on the MSSQL 2000 Publisher server using SQL Server Management Studio on the subscriber. At the subscriber DB drop down, select to create a new Subscription database, ‘NorthernLightsRepl’. 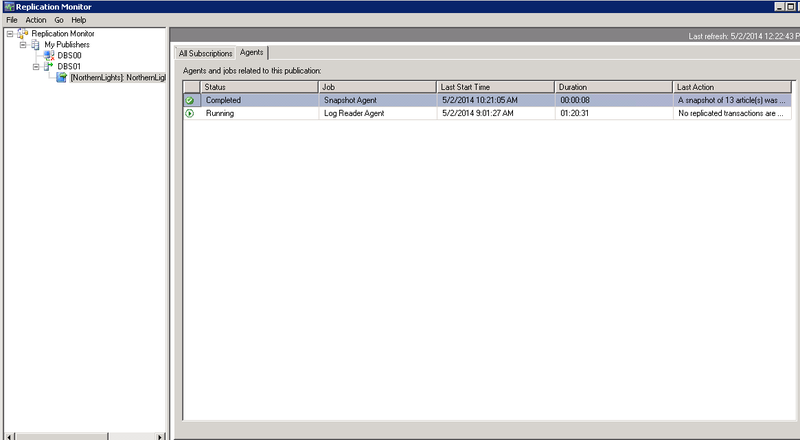 Click next and select to run the Agents continuously. At the Initialize Subscriptions screen, I selected to initialize at first synchronization.Click next and Finish to create the subscription. 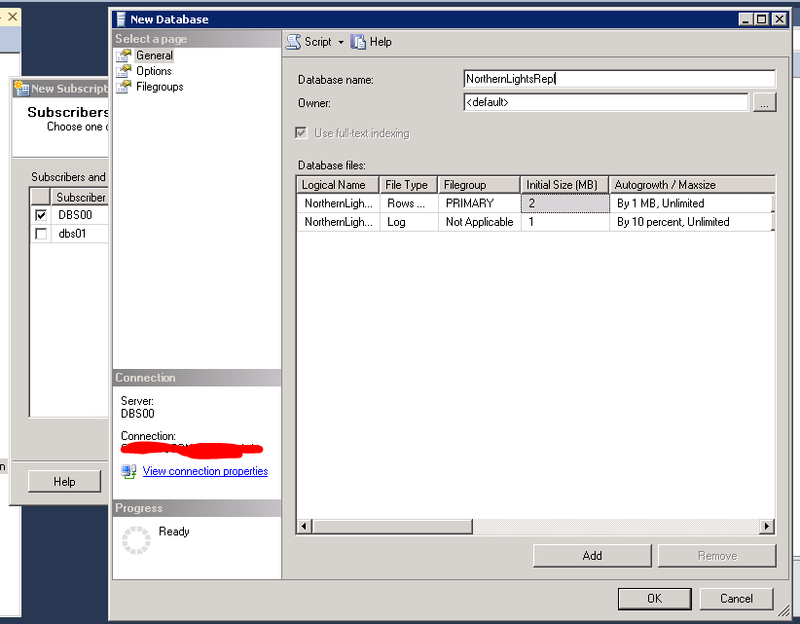 In Part 2 of this post, we will setup the second part of the replication process to the MSSQL 2012 target (subscriber). This entry was posted in Database Replication, Microsoft SQL Server, MSSQL 2000, MSSQL 2008 R2, MSSQL 2012, Publisher, Replication Agents, Subscriber, Transactional Replication and tagged Articles, Database Replication, Distributor, Enterprise Manager, Log Reader Agent, Microsoft SQL Server, MSSQL 2000, MSSQL 2008 R2, MSSQL 2012, Publication, Publisher, SQL Management Studio, Subscriber, Subscription, Transactional Replication. Bookmark the permalink.